Augustine joins the Passion of Jesus starting in the Garden of the Olives and finishing on the Golgotha. Augustine comments on Psalm 141 together with the Passion narratives of Mark and Luke. When Jesus was on earth, He prayed in His human nature and prayed to the Father in Heaven in the name of his body, the Church. 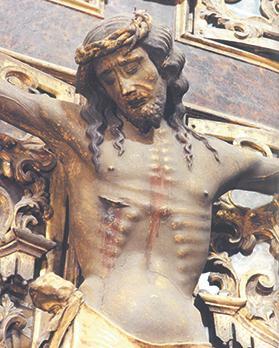 When he prayed, drops of blood flowed from his whole body. Did this blood represent the martyrdom of the whole Church? Augustine says: “Did you imagine the crying was over when he said ‘I have cried to you’? You have cried out but not as yet feel free frome care. If anguish is at an end, the Church, the Body of Christ, must suffer anguish until the end of time. The evening sacrifice is the passion of the Lord, the offering of the victim that brings salvation, the holocaust accepted to God. In His resurrection, He made this evening sacrifice a morning one. Prayer from a faithful heart rises like incense from a holy altar. In the words of St Paul, our old nature was nailed to the Cross with Him to destroy our sinful body so we may be slaves no more to sin.